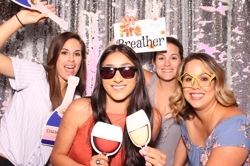 PhotoFunBooth.com - Make it an Event to Remember! e would love to be at your next big event. We service Pima County, and other surrounding areas (travel fee applied). Or you can send an email to [email protected] for a quicker response. PhotoFunBooth will come out one hour before you want us to begin (we can come out earlier for a fee). During your rental time, depending on the package you selected, we will have 1-2 attendants working the booth. 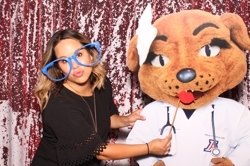 Your guests will pick FUN props, get in the booth and the FUN begins. Each guest will have a choice of three different printing finishes, black and white, color, or sepia. The picture collage will print out on either a 2x6 strip or 4x6 card with a personalized tagline and/or your company's logo. We will have a small table set up with lots of fun scrapbook materials to match your event colors and/or theme. Your guests can choose which and how many pictures they would like to put in the book. Once your event is over, you will receive your scrapbook with all the personalized pages that your guests created. How much room do you need for the photobooth? We need about a 10x10 space for our photobooth and prop table. Do you travel outside of Tucson? Yes we do travel outside of Tucson, however a travel fee is charged. How quickly do my pictures print? The pictures print in about 7-10 seconds. You can book as far in advance as you'd like. We have had brides book us out a year in advance, and we've also had brides book us the day before. 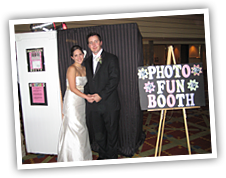 Our photobooth rentals are subject to availability. Your photos print as either a 2x6 strip or a four-picture collage on a 4x6 sheet. Yes, we require a non-refundable security deposit to reserve a booth for your event. Can we set up the booth outside? Yes, however the area must be on a level surface, as well as a shaded area in which to operate the photo booth. There must be electricity available and no wind and/or rain in the forecast. We accept cash, check and card. Call or email me for pricing.